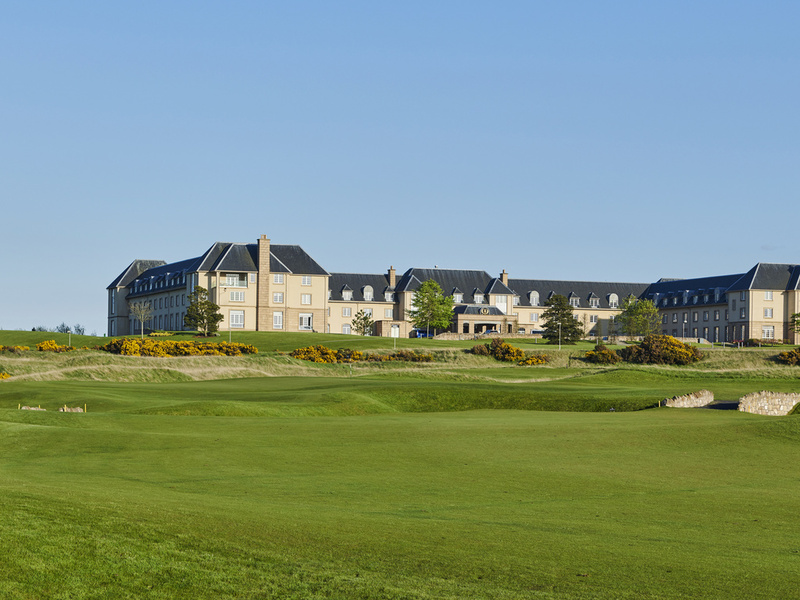 The 520 acre five star Fairmont St Andrews resort encapsulates luxury, elegance and truly breath-taking surroundings in the Home of Golf. A truly unique and special venue that makes your visit one to remember, with its lavish and stunning surroundings, pe aceful setting and stunning cliff top views of St Andrews and the North Sea. The resort prides itself with an array of fabulous facilities including two championship golf courses, several diverse yet luxurious dining outlets, and a Fairmont Spa. An idyllic location in the 'Home of Golf', the resort is a perfect destination for historic attractions, Scottish seafood, outdoor activities and architecture. Create memories in the tranquil spa, and two world-class golf courses, featuring GolfBoards. King-sized beds- thick, soft duvet covers and a feeling of total exhilaration as you relax within the comfort of your accomodations with all the five star services at your fingertips. If you are looking for a little extra space and luxury at our Scotland hotel- the suites provide ample of both in every accommodation. Uniting the charm of a classic Trattoria with contemporary flair, this venue offers traditional Italian and Mediterranean dishes made with authentic ingredients, cooked and served with passion. St Andrews Bar & Grill is set upon a spectacular cliff top with stunning panoramic views over both our championships golf courses and St Andrews Bay. Serving traditional golfers fayre by day and the finest Scottish steak & seafood by night. Providing an afternoon sweet treat that will give you a taste of London in St Andrews. Choose from a range of teas served with homemade finger sandwiches, scones with clotted cream & jam, and a selection of indulgent seasonal cakes and pastries. Sitting underneath the award-winning 'Zephyr' sculpture, is where you can enjoy a lavish breakfast buffet in the Squire Restaurant. Featuring Scottish classics of black pudding, haggis, crisp bacon, fluffy pancakes and an omelet station. As you settle into the warm relaxing atmosphere of our bar, enjoy a light snack or some casual dining. Our bar features an exceptional collection of 'Spirits of Scotland' with rare and unique Single Malts, cocktails and spirits. 추가비용을 지불하고 룸을 업스레이드 요청하였다. 직원이 처음에 이야기한 그라운드레벨 룸에 전기적 문제가 있다며 다른층의 룸으로 바꿔주었다. 나는 그 직원의 말에 신뢰가 가지 않았다. 바뀐방의 view는 기대에 미치지 못하였으며 슬리퍼와 면도기가 제공되지 않는것도 의아스러웠다. 하지만 호텔은 전반적으로 쾌적하고 안락하며 멋진 인테리어와 주변경관은 매우 안상적이었다. 더 오래 머물 수 없어 아쉽다. K. Hwayoung님께, Fairmont St Andrews Scotland 이용 내역 설문조사에 참여해 주셔서 대단히 감사드립니다. 고객님으로부터 좋은 평가를 받는 것은 언제나 기분 좋은 일입니다. 고객님께서 제시해 주신 의견은 모든 팀원들과 공유될 것이며 이러한 의견은 지속적으로 높은 수준의 서비스를 제공하고자 노력하는 모든 임직원들의 사기를 북돋는 데 큰 버팀목이 될 것입니다. 고객님의 소감을 알려주셔서 다시 한번 감사드리며 향후 보다 나은 서비스로 만나 뵙기를 바라겠습니다. 감사합니다. LESLEY FALCONER EXECUTIVE ASSISTANT Fairmont St Andrews St Andrews Fife, KY16 8PN T +4… 001 le… fairmont.com | standrewsbay.com Think before you print. Help us reduce our environmental impact. W. Hye Ran님께, Fairmont St Andrews Scotland 이용 내역 설문조사에 참여해 주셔서 대단히 감사드립니다. 고객님으로부터 좋은 평가를 받는 것은 언제나 기분 좋은 일입니다. 고객님께서 제시해 주신 의견은 모든 팀원들과 공유될 것이며 이러한 의견은 지속적으로 높은 수준의 서비스를 제공하고자 노력하는 모든 임직원들의 사기를 북돋는 데 큰 버팀목이 될 것입니다. 고객님의 소감을 알려주셔서 다시 한번 감사드리며 향후 보다 나은 서비스로 만나 뵙기를 바라겠습니다. 감사합니다. LESLEY FALCONER EXECUTIVE ASSISTANT Fairmont St Andrews St Andrews Fife, KY16 8PN T +4… 001 le… fairmont.com | standrewsbay.com Think before you print. Help us reduce our environmental impact.